The Bob hairstyle is of the classiest and evergreen hairstyles of them all and what kept it in fashion for such a long time is the ability to evolve and be upgraded and given that modern touch over the years. This incredibly successful style has created a legacy of its own is a definite trend setter. Here in this list, we are going to show you some of the easy to style shorter versions of the bob, as they are easier to maintain and are more preferable for the hot summer season. This sleek version of the bob hairstyle can be achieved pretty easy with the help of the paddle brush. Here we have long bangs that fall gorgeously on the forehead, covering part of it and part of the eye in a mysterious and fashionable way. You can finish up by straightening the hair in order to enhance the sleek effect of the whole look. In this incredibly cool style the hair length can get to the chin with just a few strands can be left hanging around the face giving it a very playful and joyful look. The bangs need to be precisely partitioned and could be left covering a part of the forehead. The layers in this style are masterfully blended in order to give that a rather light and airy feel to the hair. This style works great with additional coloring or highlights. This look is a classic version of the bob hairstyle. To get this look first you must part the hair in down the middle. 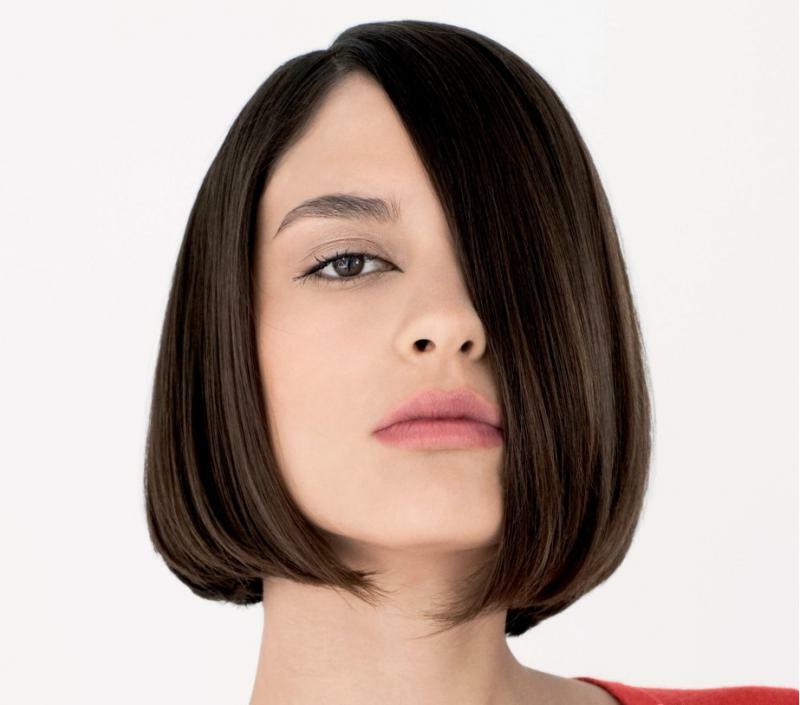 The length should be even on both sides but the overall length is a little longer than the one we usually see in a bob style. This particular version is perfect for women with round or square shaped faces. It is very easy to do and it is most suitable for ladies with thicker hair. Like the name suggests in this style works best for a blonde hair to get the platinum look. With this look we have a rather short hair at the back and longer sides that reach the level of the chin and could even go further down up to an inch or so. It requires a straight hair and although a flat iron could be used, it doesn’t look very well on a curly hair. This style looks amazing on round and square shaped faces. Here the hair extends to just a little below the chin level and at the back it falls just at the level of the shoulder. The highlights in this interesting extended version of the bob style are the long bangs that give a better look of the curves of the face. In order to get the look of this dazzling version of the bob it requires blunt bangs and a linear shape to the hair. To get this style right you need to bring the bangs forward and roll it inwards using a round brush. For enhancing the effect of this glamorous look you can use the flat iron to smoothen it up and add more class and allure to it. The highlight in this particular version of the bob is the soft feel and look, given by short blunt cut and the many wispy layers. If you are bored of bangs all the time, this wavy bob style is the perfect solution for you. The hair is parted in half at the crown of the head to give it a glamorous and fashionable look. As you probably guessed from the name, this hairstyle requires a dark tone of the hair color. Here we also have lots of layers both at the back and on the sides that are essential to the overall look. In order to get the full glamour of this look, you need to make sure that layers are perfectly and masterfully blended. The swept to the side bangs give an even softer look to this incredibly beautiful look. We gave you a version perfect for blonde hair and another one suitable mostly for darker tones, so it is time to give you one for the ladies that prefer the red hot tone for their hair color. In this sleek look we have softer bobs with no bangs at all. The red color is the best one for this style, as it gives it that extra brightness that adds more class to the whole look. For the girls with pear or heart shaped faces bangs could be added to the sides in order to balance the whole look.